If you’re looking to add beauty into your yard then you should consider adding some of your own personal touches. There is more to just moving around furniture; you have to take an otherwise blank space and turn it into a retreat that is both luxurious and beautiful. There should be personalized, unique elements along with innovative ideas. Your patio should not only be spectacular to look at but also functional. In order to get more out of your outdoor space, look at some of these beautifying ideas that Architectural Landscape Design can do for you. Consider how you’d like to use the space in the backyard that you have. Perhaps to relax, entertain, or play sports with the family? The way you’d like to use it is a big factor when it comes to designing the particular space. You should have something for everyone out back. Architectural Landscape Design will work closely with you on a design that is appealing to your tastes. To fully enjoy your backyard, turn it into an all-weather space. With the right landscape features, you’re able to enjoy the rain, as well as the sunshine with this type of space. Our designers can add different shade options by partially shading the living area and fully covering the dining area. Placing the fit pit in an open area is able to add more to the feel and look as well. You’re not fully going to decorate the yard if you do not incorporate proper lighting. By having us place outdoor landscape lighting in appropriate places, you’re able to make the yard more inviting and attractive. It is able to be seen in the afternoon and evening while entertaining or just illuminated to show off its beauty even while not in use. If you want to create a spread-out, colorful ambiance then we will use spreading lights or low voltage lights. In the partially shaded areas, solar powered lighting can add a beautiful touch. Bringing in furnishings into your patio space can provide a beautiful area to rest and entertain. You’re able to sit in this area and enjoy your space. These pieces can bring more to your outdoor area. You’re able to place furniture in the dining, living and fire pit areas to have seating for all – no matter what they’d like to do. Add a chaise lounge by the hot tub to provide a relaxing area to sit out on after your soak. And for the ultimate in personal design, consider adding pieces of our custom-designed natural furniture, handcrafted from natural Minnesota stone. You’re able to bring nature into focus with the right extras added to your outdoor space. Add a beautiful custom waterfall that we design or a small pond to bring some nature to the backyard. Perhaps add brightly colored fish to a small pond, or add a recirculating fountain for a refreshing touch. We can add a unique water feature to any landscape. Adding more luxury to your backyard doesn’t have to be huge. By simply adding a hot tub, you’re able to create a place to go and relax after a hard day or even entertain by using it. Make sure to cover it to protect it from the weather but also to keep it maintained. 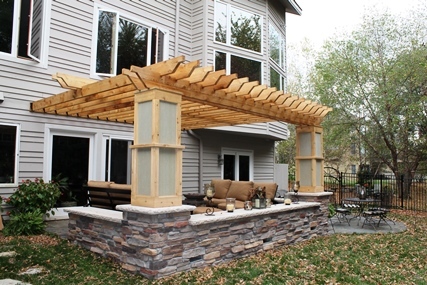 We can provide a beautiful pergola over top of the area to create a getaway area to enjoy. These are just some of the options to producing an outdoor getaway in your own backyard. To discuss converting your property into your own private oasis, give us a call today.